Beginning in August 2008 it was decided that an appropriate topic for the 2008 Pulse Survey would be an incentive industry trends outlook for the upcoming years and with the continued economic conditions, also an appropriate topic for the trends outlook for 2013. Given that the Incentive Research Foundation (IRF) is charged with advancing the science of incentives, it surveyed industry professionals to obtain their opinions about the more salient trends affecting the industry during 2014. 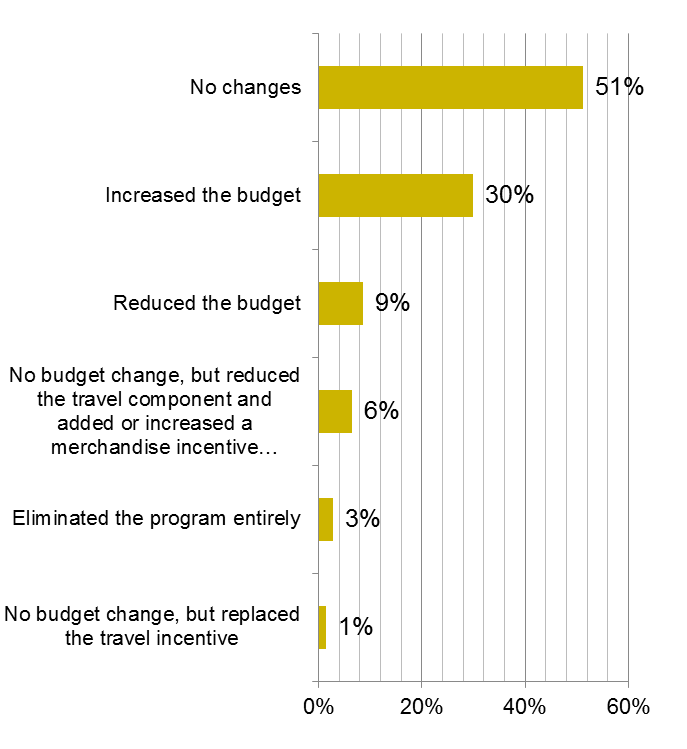 To this end, the IRF asked these professionals questions on trends with regard to incentive travel programs, merchandise non-cash programs, and budget changes forecast for 2014. Sensitivity to others’ perceptions of company incentive programs. Invitations to participate in this online survey were successfully delivered to 2,104 incentive providers, suppliers to the industry and corporate incentive travel buyers. Data collection was conducted July 31st through August 10th, 2015. Findings indicate that the trend is in decline this period compared to the previous survey periods which indicated a strong positive upward trend for each of the core issues beginning in July 2009 – May 2014. The trend is in decline this survey period with respect to the perceptions of the company’s financial forecast influences the design and implementation of our incentive program(s) compared and the previous three survey periods. 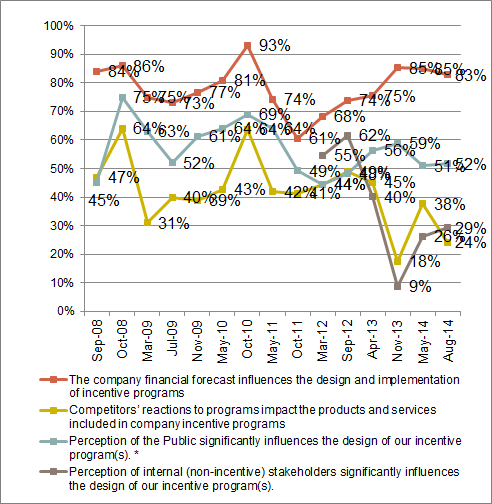 The perception of internal (non-incentive) stakeholders influence on the design of incentive programs remains similar compared with 2014. These questions were asked only of Corporate participants. Strongly negative 0% August 2015 vs. 1% August 2014. 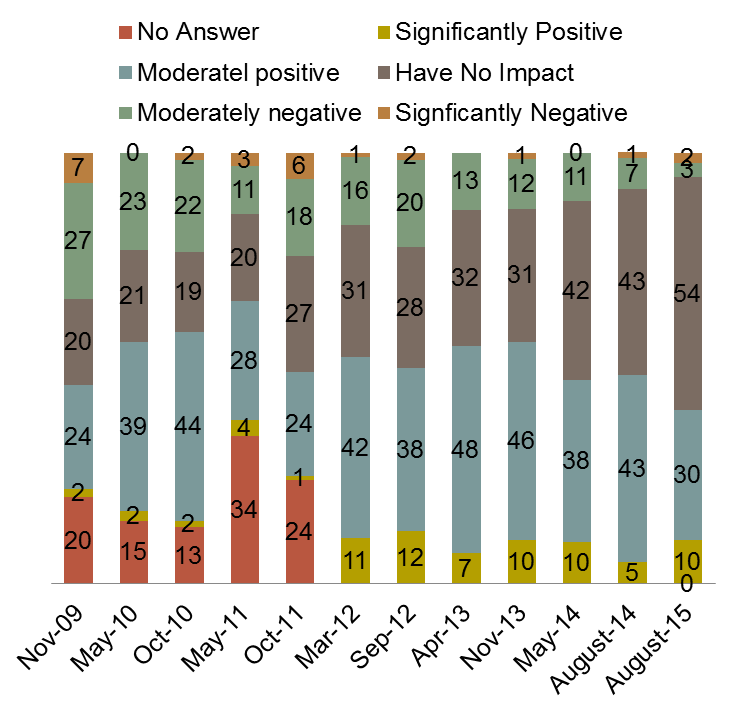 All negative impacts 11% August 2015 vs. 15% August 2014. 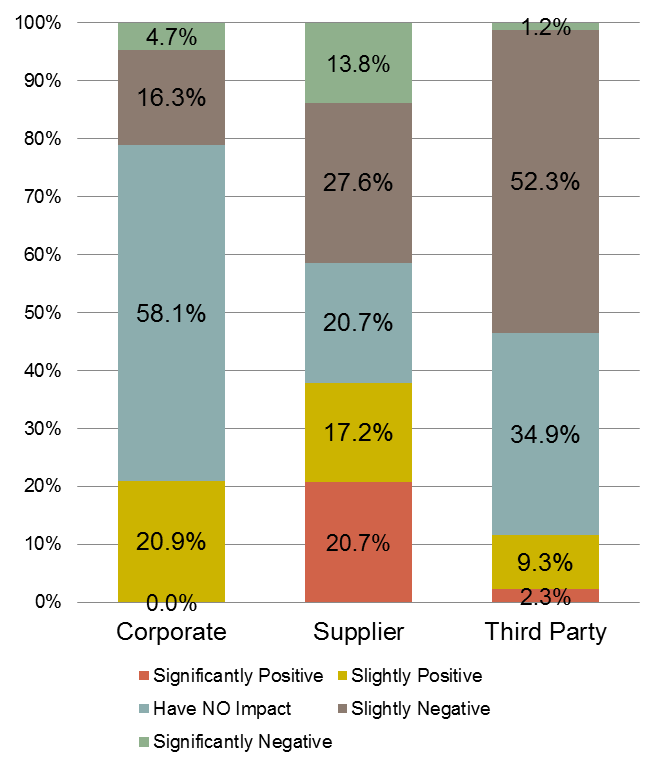 The Supplier and Third Party segments are significantly more likely to perceive the impact of the economy to have a more “positive” impact than the Corporate segment. Third Party 66.3% total positive. Most respondents (42%) have a negative perception of the current Air Transportation Environment and it’s impact on incentive travel plans. The percent of “total negative” responses has decreased 9% compared to August 2015. Significantly negative- 4% August 2015 vs. 8% August 2015. 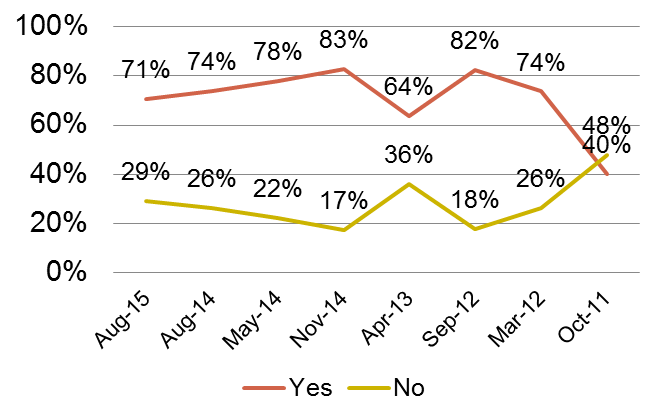 All negative perception- 42% August 2015 vs. 51% August 2014. The Supplier segment is significantly more likely to perceive the impact of the air transportation environment as more “positive” (37.9%) than the Corporate segments. 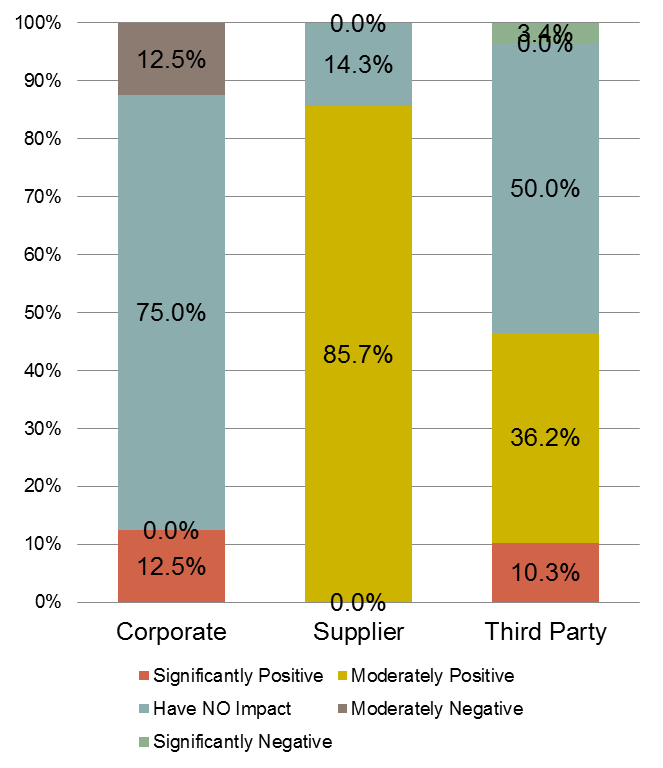 The Third Party segment is significantly more likely to perceive the impact as “negative” (53.5%) than the Corporate. Techniques Used In Coming Year To The Air Transportation Portion Of Incentive Travel Programs, What Component? 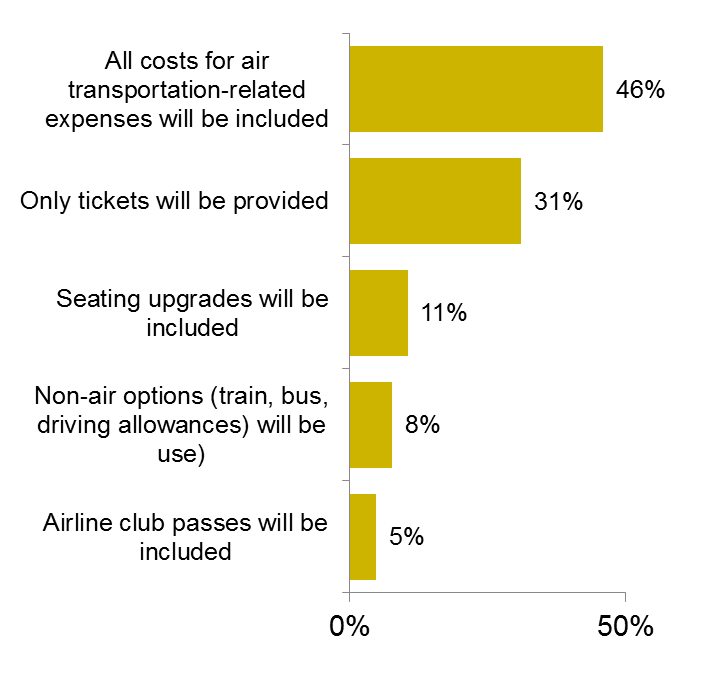 46% anticipate that “All costs for air transportation-related expenses”, are to be included components of Incentive Travel Programs in the coming year. 31% indicate that “Only tickers will be provided”. 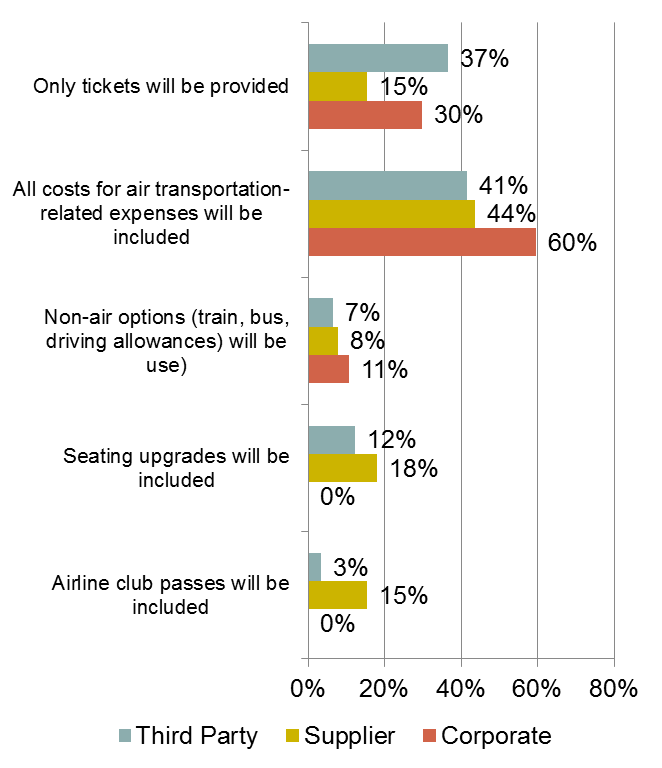 11% indicate that seating upgrades will be included. 8% indicate that “Non-air options” will be included. Third Party respondents are more likely to us “Only tickets will be provided” as a technique than both Corporate and Supplier respondents. 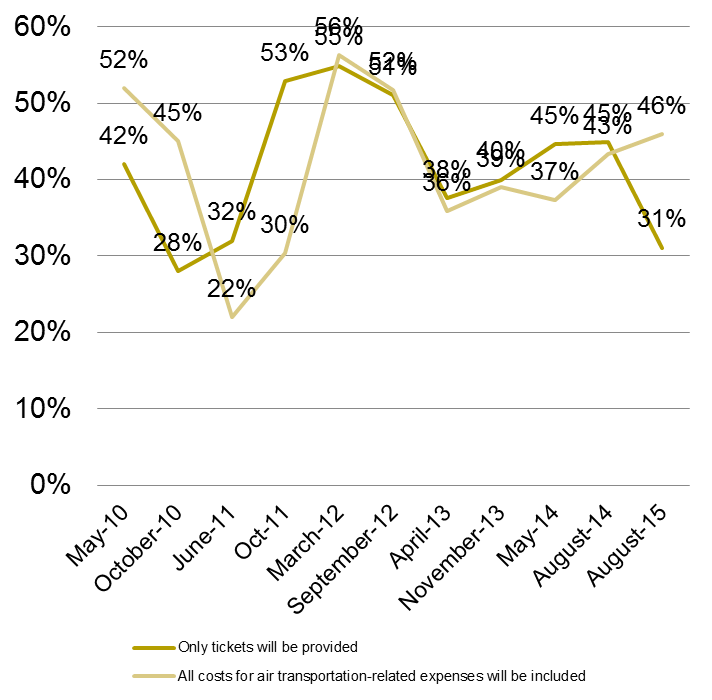 The inclusion of “Only tickets will be provided” has decreased significantly since compared with August 2014 and the inclusion of “All costs for air transportation related expenses” continues to increase significantly- 15% since May 2014, 9% since August 2014. 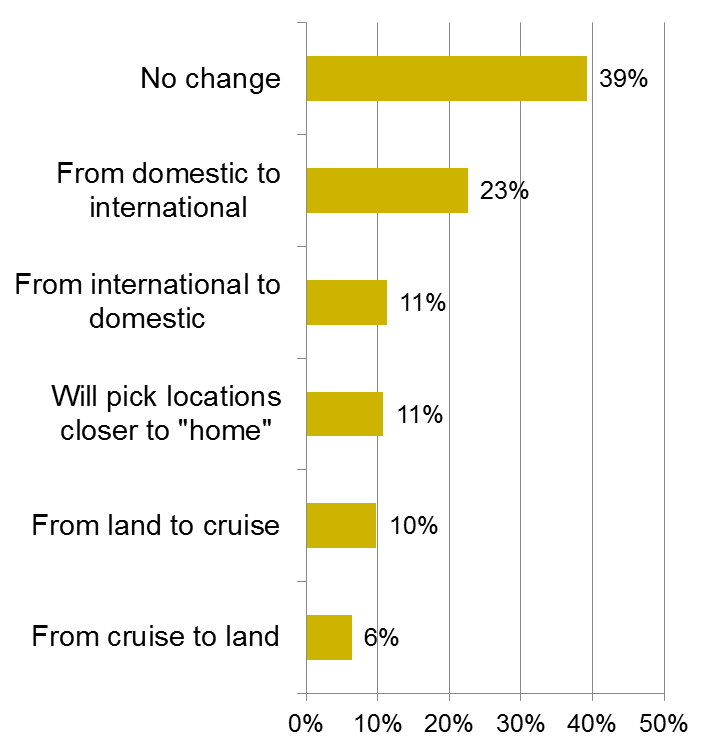 Most of the respondents (39%) anticipate no change with respect to the program destinations for Incentive Travel Programs in the coming year. 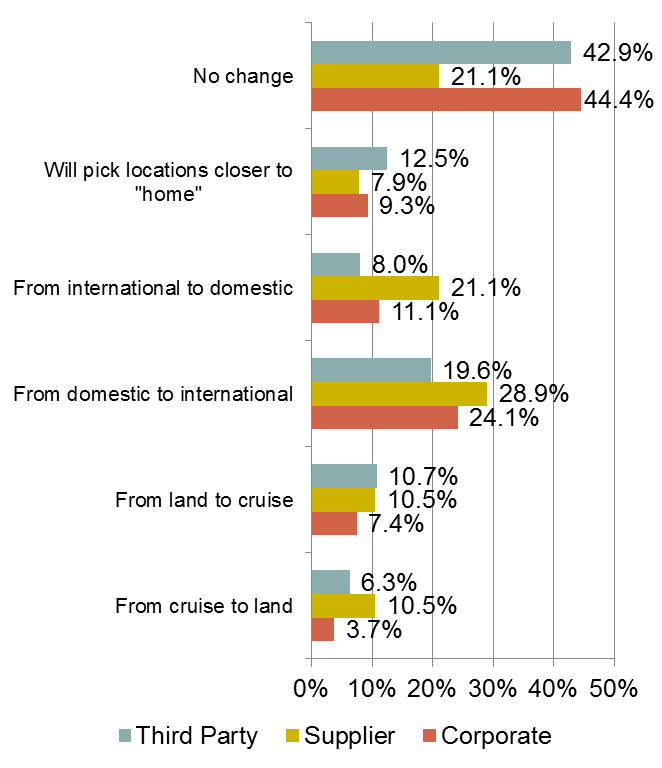 11% “Will pick locations closer to “home” with regards to the travel program destinations. Most of the Corporate and Third Party segments anticipate no changes to program destinations. Third Party and Corporate segments are more likely to anticipate no changes than the Supplier segment with regards to travel program destinations. 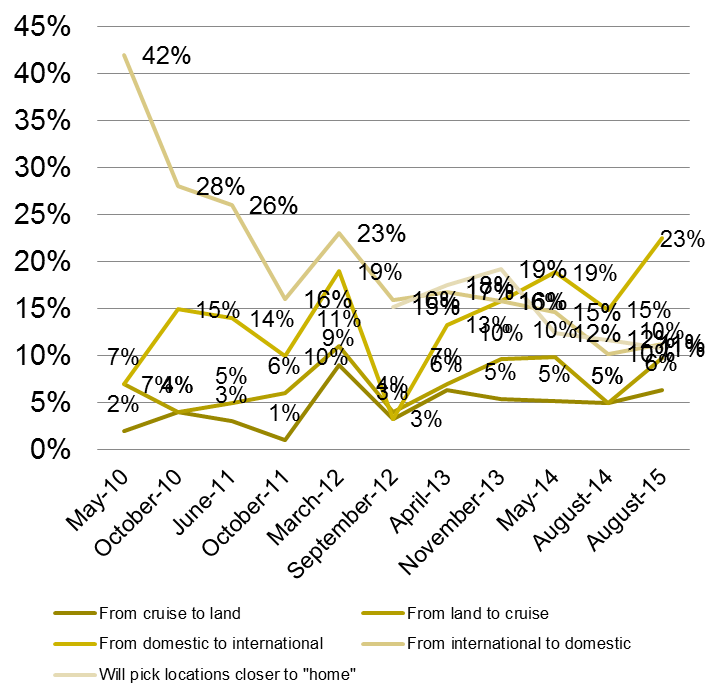 There has been a significant decrease in program destinations from “International to Domestic” since 2010. 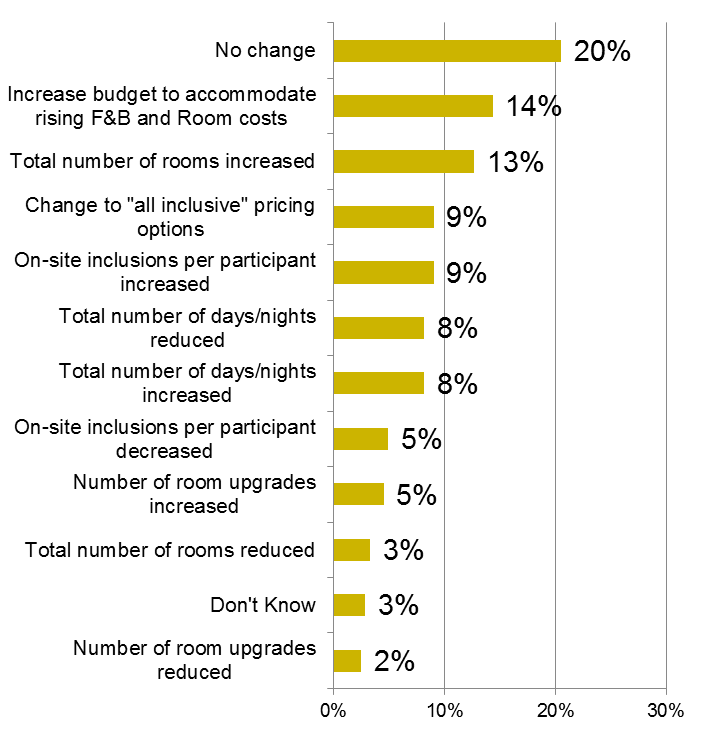 14% percent of respondents anticipate a change to “Increase budget to accommodate rising F&B and Room costs” for the accommodations portion of Incentive Travel Programs in the coming year. Most of the Corporate respondents anticipate no changes to program destinations. There is very little difference amongst the Corporate and 3rd Party segments with regards to changes on the upcoming year to incentive travel accommodations. 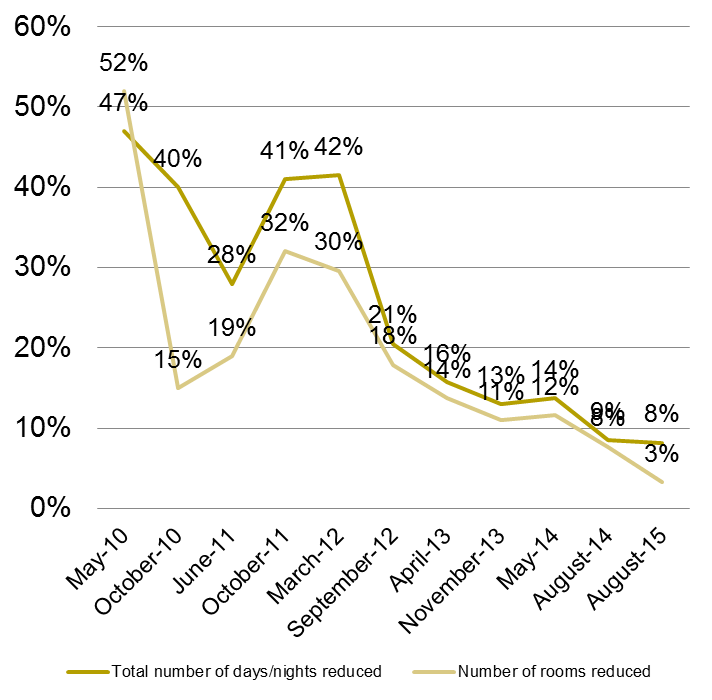 The “anticipated reduction” of both components with regards to hotel accommodations continues to decline compared to the previous survey periods. Fifty-six percent (63%) of respondents anticipate No Change with regards to Sponsored Non-Meal Related Components for Incentive Travel Programs in the coming year. Both Corporate and Third Party respondents anticipate a “moderate increase” for Sponsored Non-Meal related components. 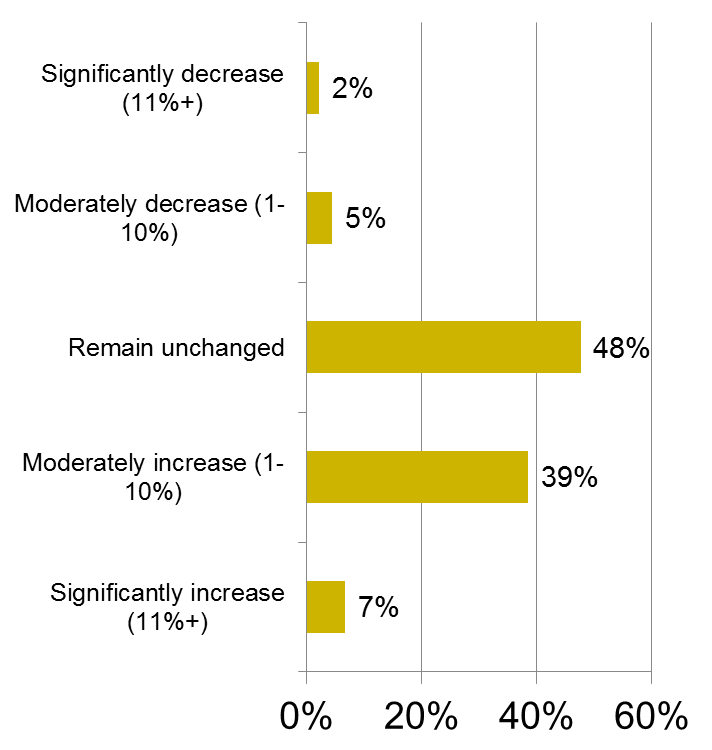 Most of the respondents (55%) anticipate No Change with regards to involvement of procurement and purchasing for Incentive Travel Programs in the coming year, 43% agree that procurement involvement will increase by some degree in the coming year. 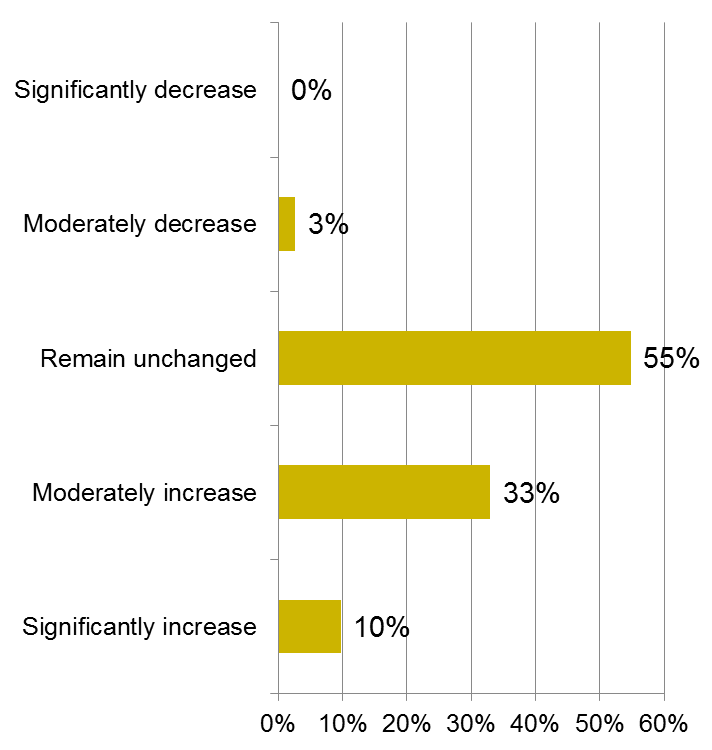 33% indicate that procurement and purchasing involvement will “Moderately Increase” in the coming year. 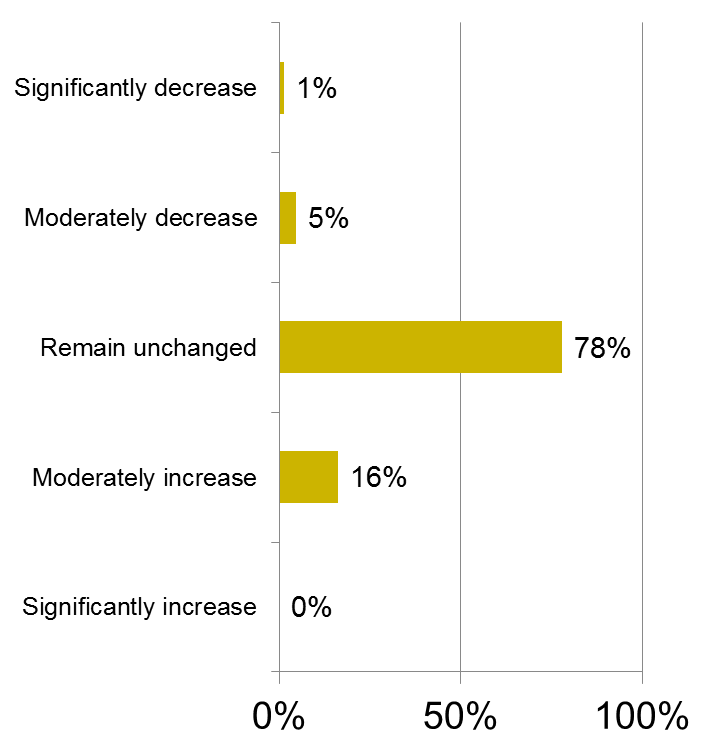 10% indicate that procurement and purchasing involvement will “Significantly Increase” in the coming year. Supplier respondents are more likely to anticipate the involvement of procurement and purchasing in travel incentive programs to “significantly increase” when compared with the Corporate and Third Party segments. Third Party respondents are more likely to anticipate the involvement of procurement and purchasing in travel incentive programs to “moderately decrease” when compared with the Corporate and segment. Forty-seven percent (67%) of the respondents anticipate budgets for Incentive Travel Programs to “Slightly Increase (1-10%)” this coming year. 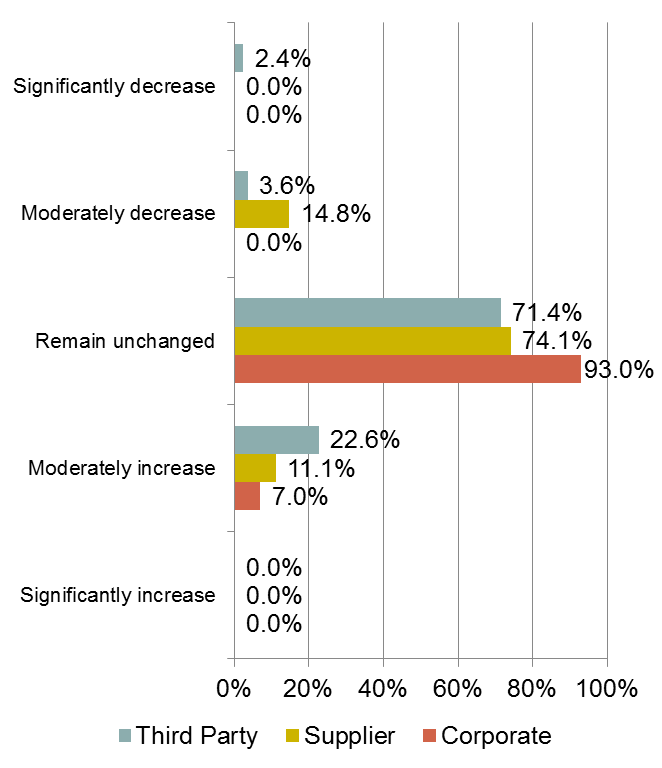 8% indicate that budgets for Incentive Travel Programs will decrease by some degree in the coming year. 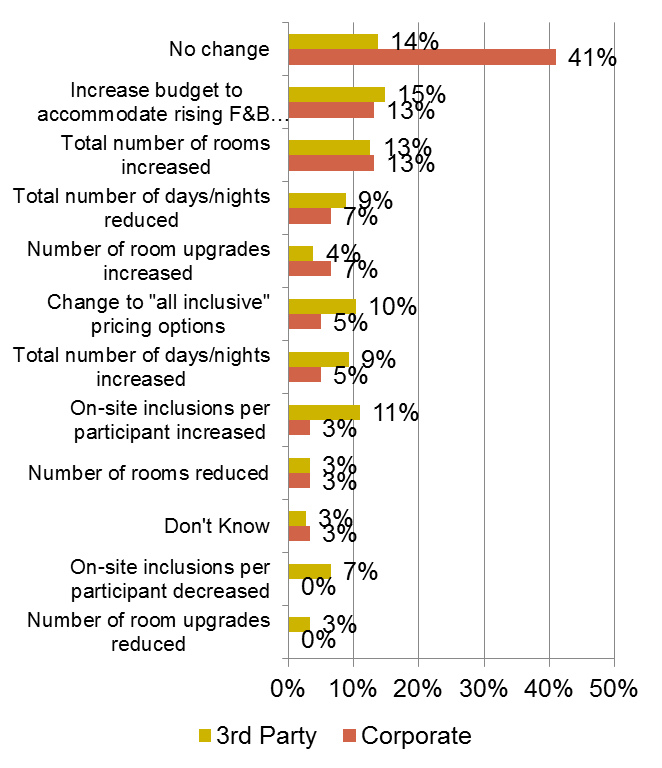 26% indicate that budgets for Incentive Travel Programs will remain unchanged this coming year. Third Party and Supplier respondents anticipate travel incentive program budgets to “remain unchanged”, when compared with the Corporate segment. Third Party respondents anticipate that travel incentive program budgets will “slightly increase” when compared with Corporate and Supplier respondents. 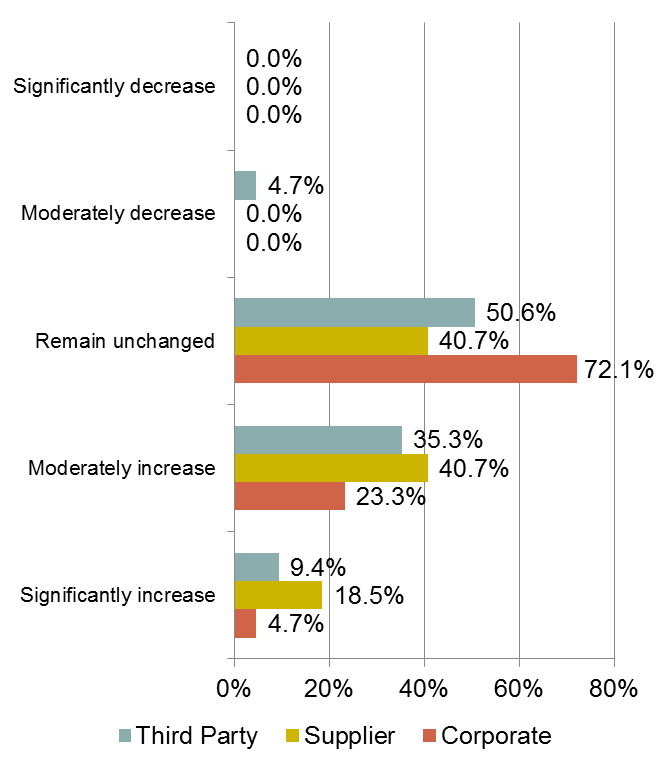 Trend Strategy For The Consideration Of Award Strategy Moving (Either Temporarily Or Permanently) From "Group Trips" To "Individual Travel Packages"
The majority (78%) of the respondents anticipate no changes (either temporarily or permanently) from "group trips" to "individual travel packages" in the coming year. A combined 6% indicate that the consideration of award strategy moving (either temporarily or permanently) from "group trips" to "individual travel packages“ in coming year to decrease. 16% indicate that the consideration of award strategy moving (either temporarily or permanently) from "group trips" to "individual travel packages“ to increase in the coming year. 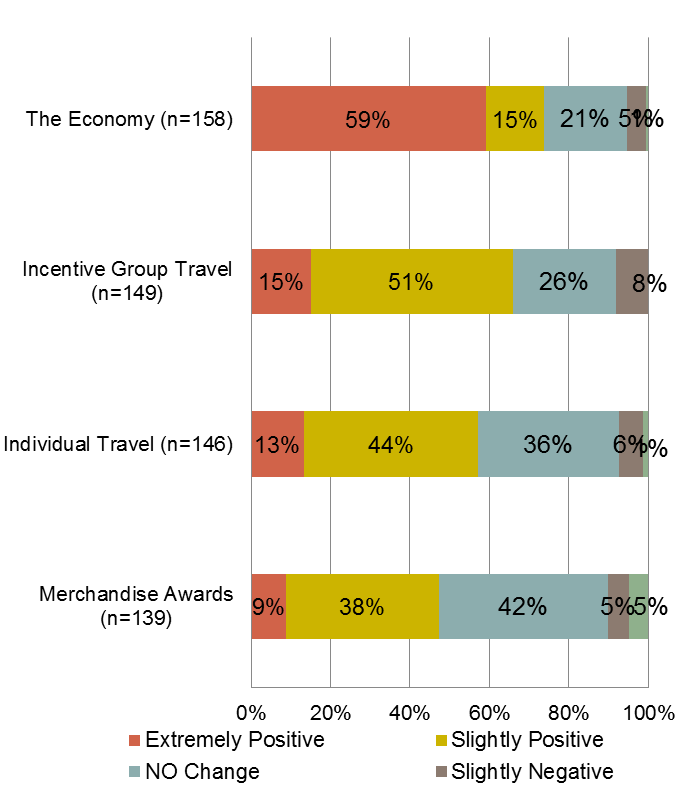 Trend Strategy For The Consideration Of Award Strategy Moving From "Group Trips" To "Individual Travel Packages"
Supplier respondents indicate that the consideration of award strategy moving (either temporarily or permanently) from "group trips" to "individual travel packages“ to moderately decrease in the coming year when compared with the Corporate and Third Party segments. 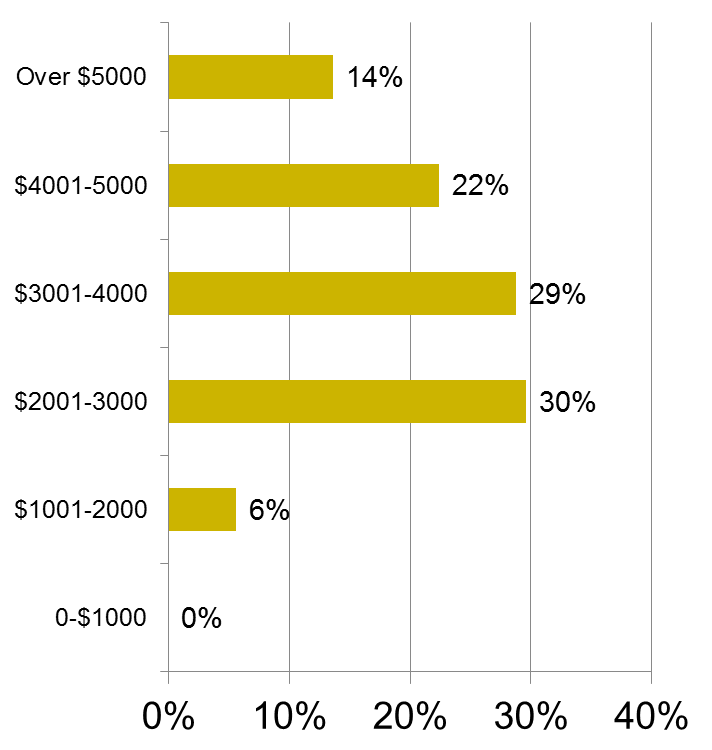 30% of the respondents indicate the average spend per-person is $2001 - $3000. 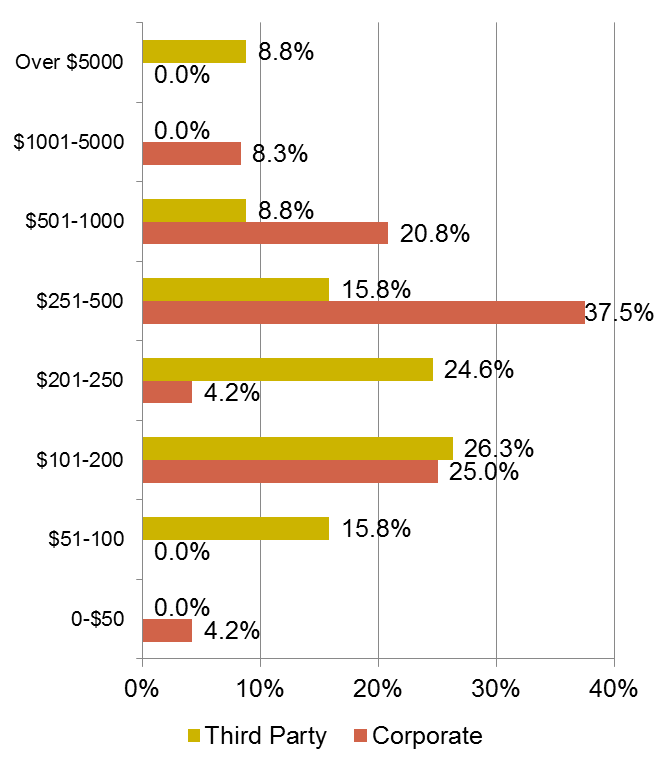 6% indicate that the average spend per person is $1000 - $2000. 3rd Party respondents are more likely to indicate the average spend per-person on Incentive travel programs to be between $3001 - $4000. Corporate respondents are more likely to indicate the average spend per-person on Incentive travel programs to be between $2001 - $3000. The majority (84%) of the respondents indicate the standard qualifying period for incentive travel programs is 12 months. 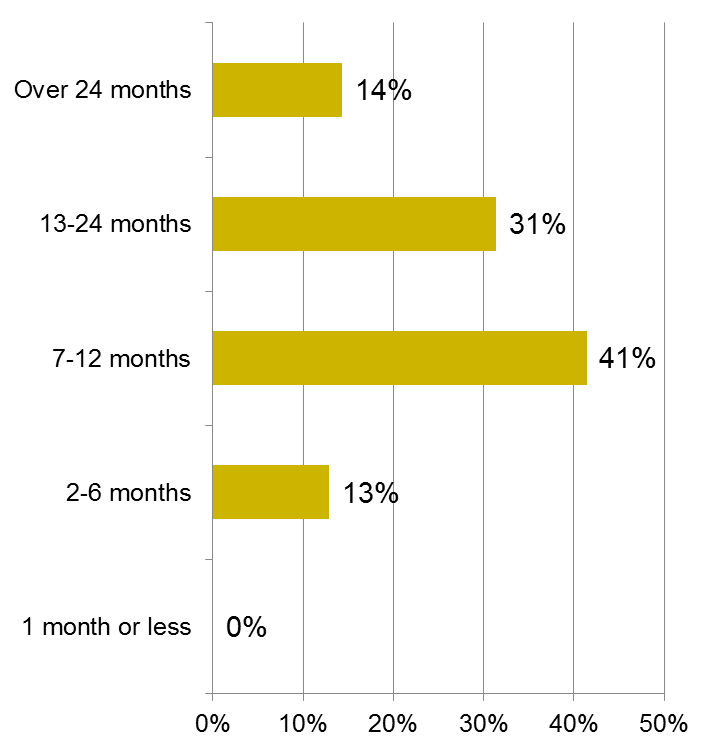 Most of the respondents *41%) indicate they normally have 7-12 months for booking incentive travel programs. 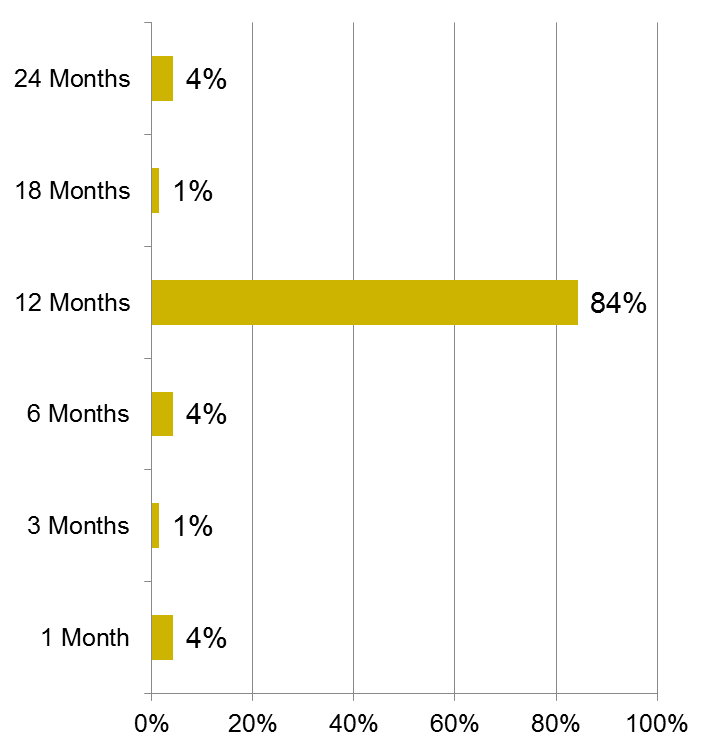 31% of the respondents indicate they normally have 13-24 months for booking incentive travel programs. Geographic Region Chosen as “Destinations" for Incentive Travel Program(s). 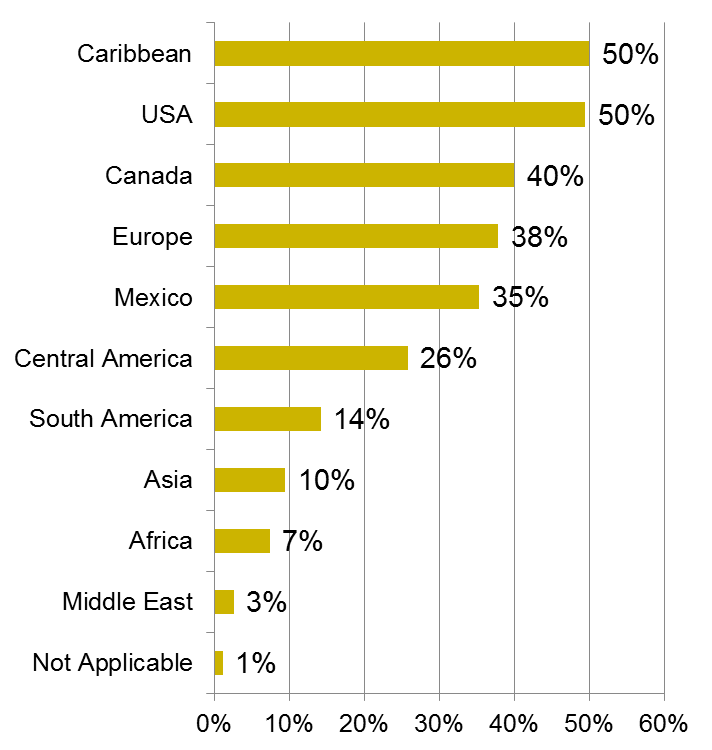 50% of the respondents indicated that the Caribbean & USA was their chosen region for Incentive Travel Destination programs. 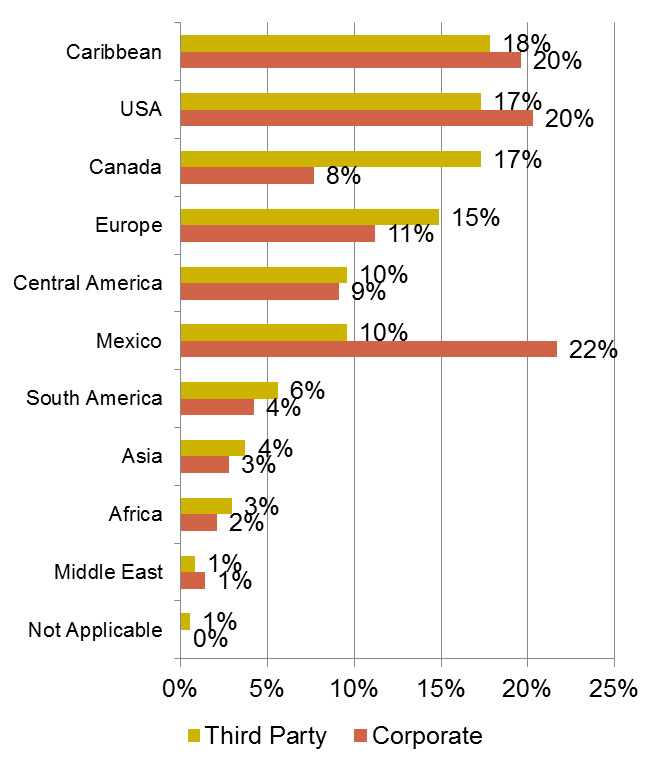 Corporate respondents are significantly more likely to choose Mexico as the destination for incentive travel programs compared to Third Party respondents. •In August 2015, respondents continue to anticipate the impact of the economy to have a “positive” effect on their ability to plan and implement merchandise non-cash incentive programs potentially indicating a positive trend in the coming year. Negative impact 5% in August 2015 vs. 8% in August 2014. No impact 54% in August 2015 vs. 43% in August 2014. Positive impact 40% in August 2015 vs. 48% in August 2014. 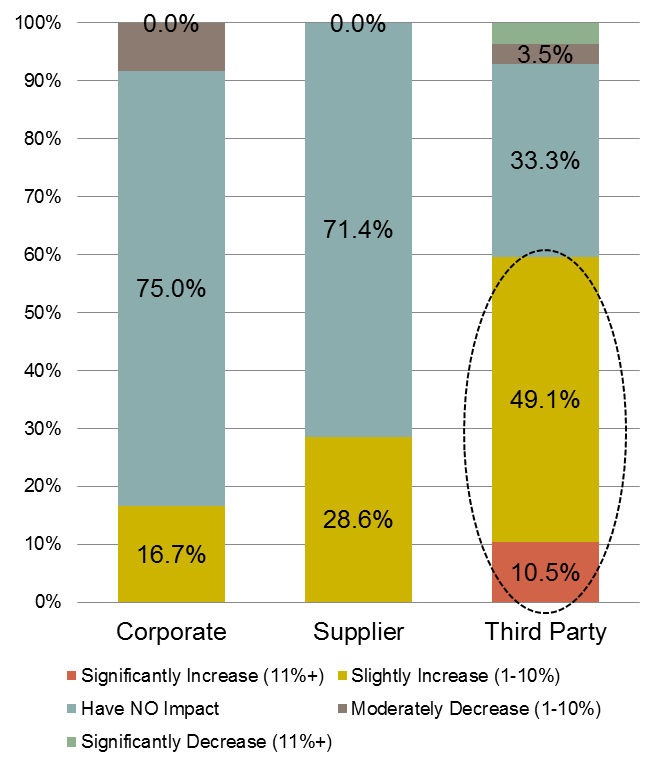 The Corporate segments are significantly more likely to perceive the impact of the economy to “have no impact” compared with both the Supplier and the Third Party segment. 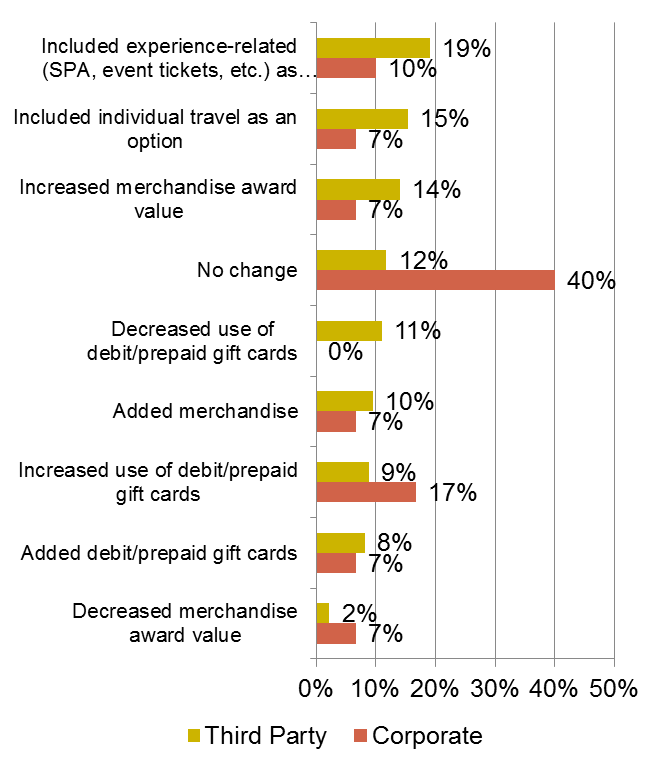 17% indicate “No change” to the merchandise non-cash incentive program this year. 14% indicated “Included individual travel as an option”. 13% indicated “Increased merchandise award value”. 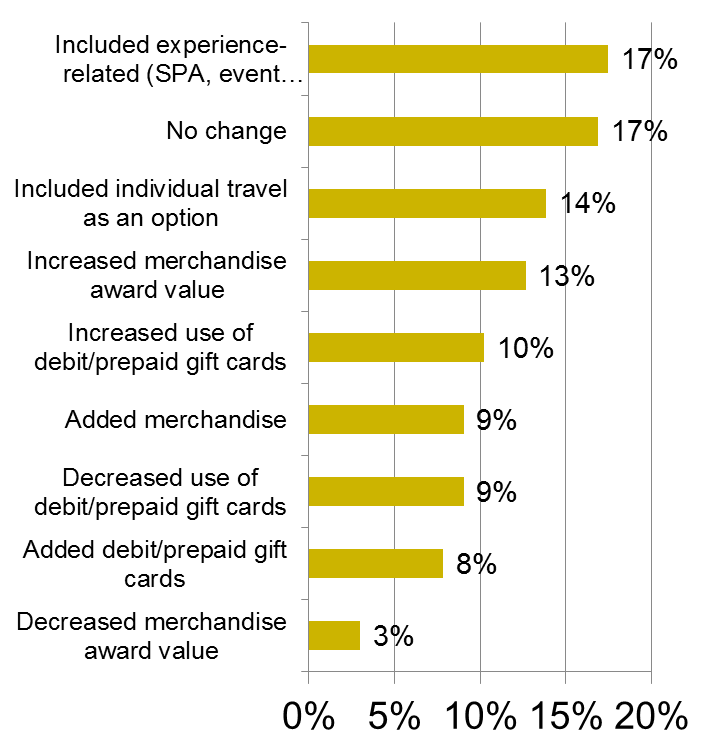 10% “Increased use of debit/prepaid gift cards”. 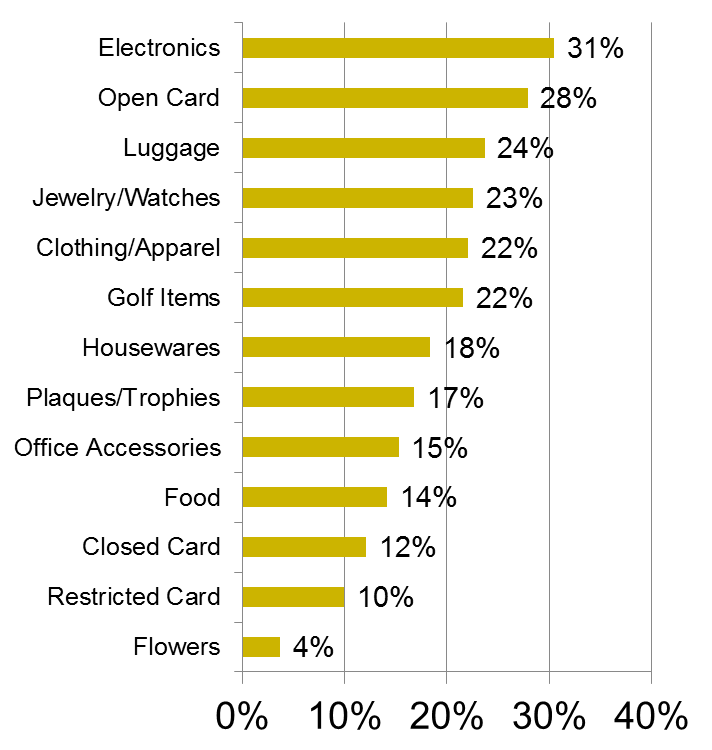 Electronics (31%) and Open Card (28%) are the most common merchandise used in Reward and Recognition Programs. 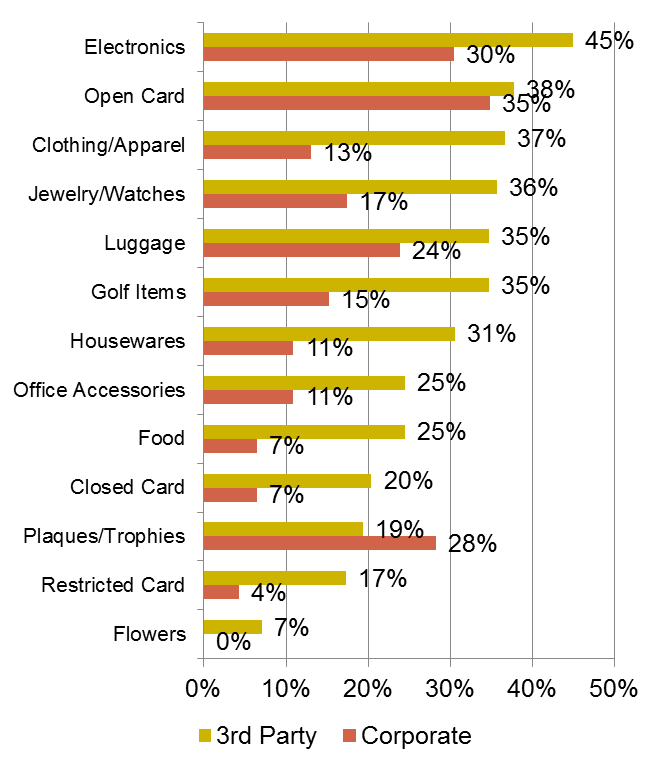 Third Party respondents are significantly more likely to use all of the listed merchandise awards, except “Plaques/Trophies” when compared with the Corporate respondents. A majority (71%) of the respondents indicate they use a points based system for their Merchandise Non-Cash Incentive program(s). 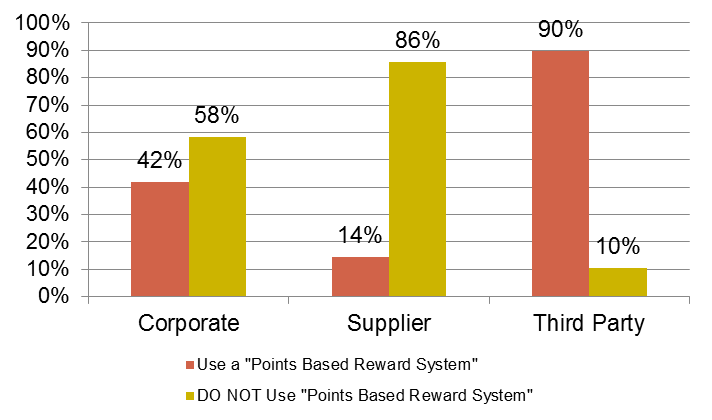 Third Party respondents are significantly more likely to use a points based system than the Corporate and Supplier respondents. Forty-eight percent (48%) of the respondents anticipate budgets for Non-Cash Incentive Programs to “Remain unchanged” this coming year. 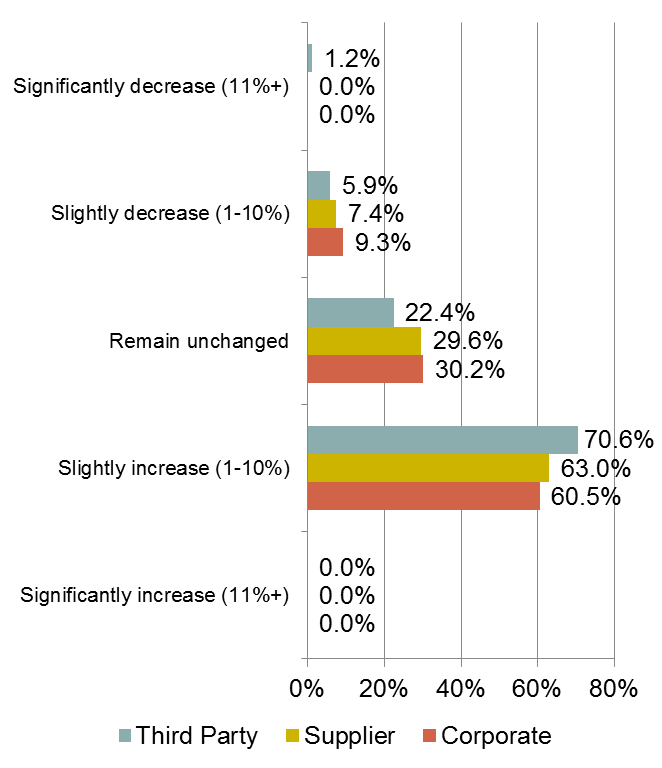 7% indicate that budgets for Non-Cash Incentive Programs will decrease by some degree in the coming year. 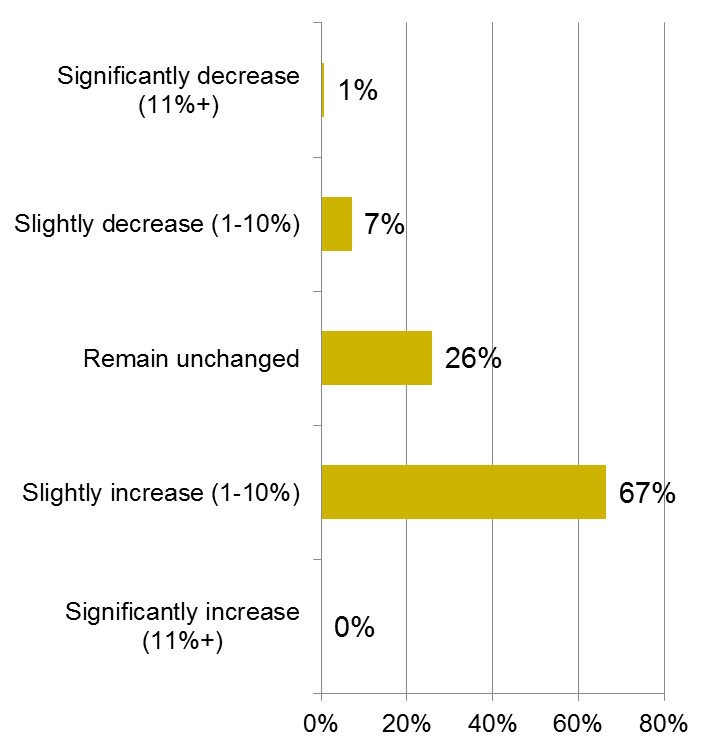 46% indicate that budgets for Non-Cash Incentive Programs will increase by some degree in the coming year. Comparing the anticipated changes in Non-Cash incentive program budgets by respondent category, we find that Third Party respondents are significantly more likely to anticipate “increases” in Non-Cash Incentive Program budgets in the coming year. In general, respondents indicated that they anticipate most incentive program elements to remain the same in the coming year. The “Awards Budget” is the element that has the highest reported increase in the coming year at 38%. Most (26%) of the respondents indicate the average spend per-person is $101 - $200. 22% indicate the average spend is $251-500. 3rd Party respondents are more likely to indicate the average spend per-person on Incentive travel programs to be between $201 - $250 compared with Corporate respondents. 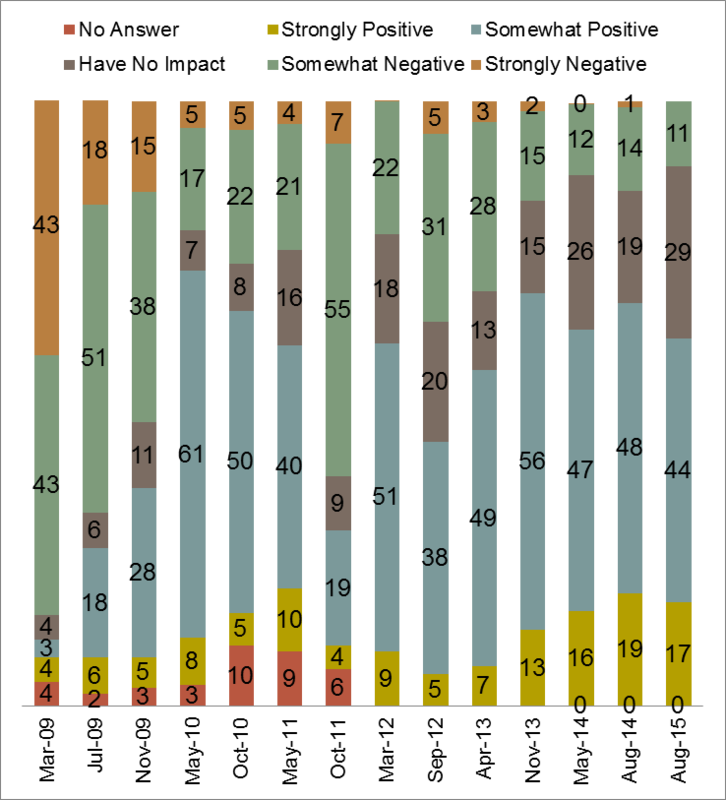 Corporate respondents are more likely to indicate the average spend per-person to be between $251 - $500 compared with 3rd Party respondents. 51% of the respondents anticipate no changes to the budget for Incentive Programs in the coming year as a result of the recent economic conditions. 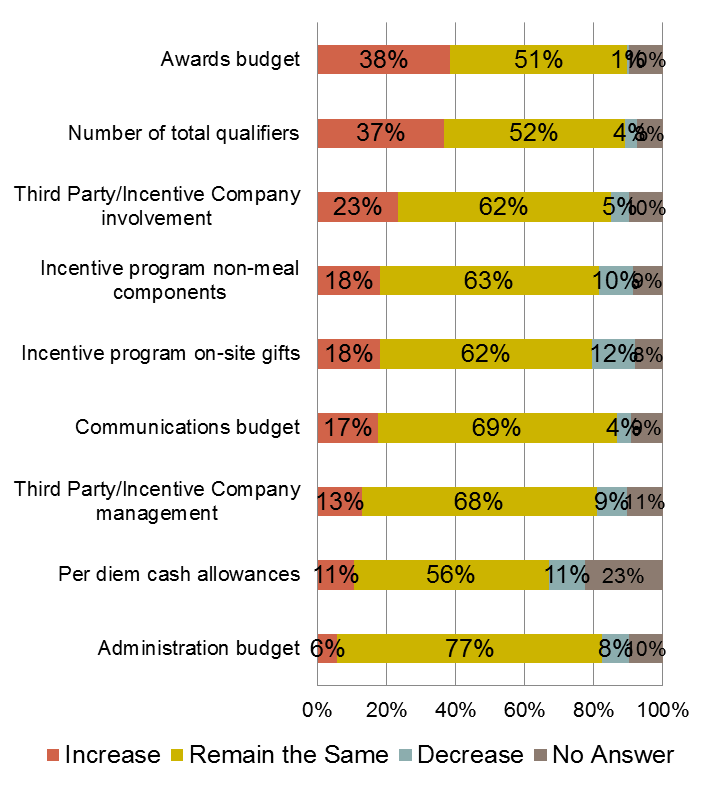 30% indicate that budgets for Incentive Programs have increased as a result of the recent economic conditions. 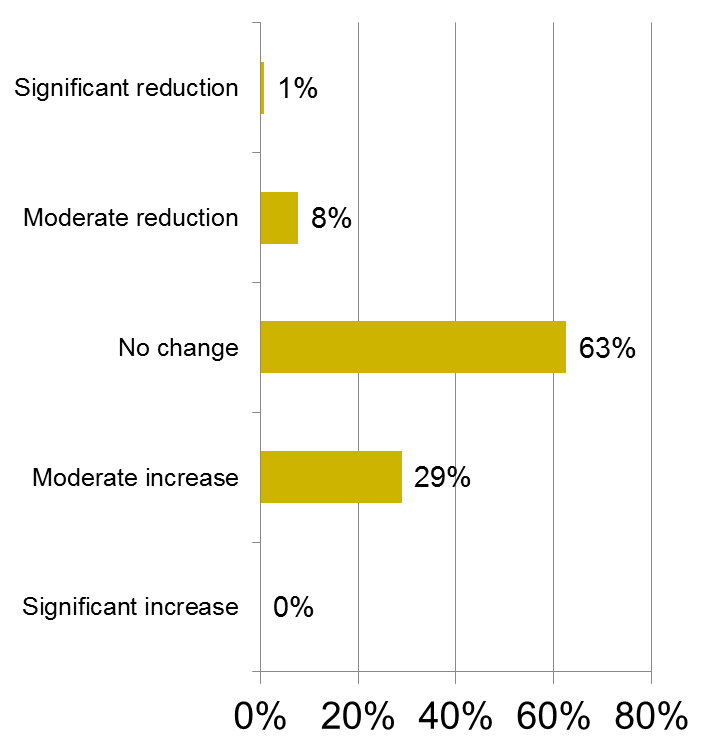 9% indicate that that budgets for Incentive Programs have been reduced as a result of the recent economic conditions. 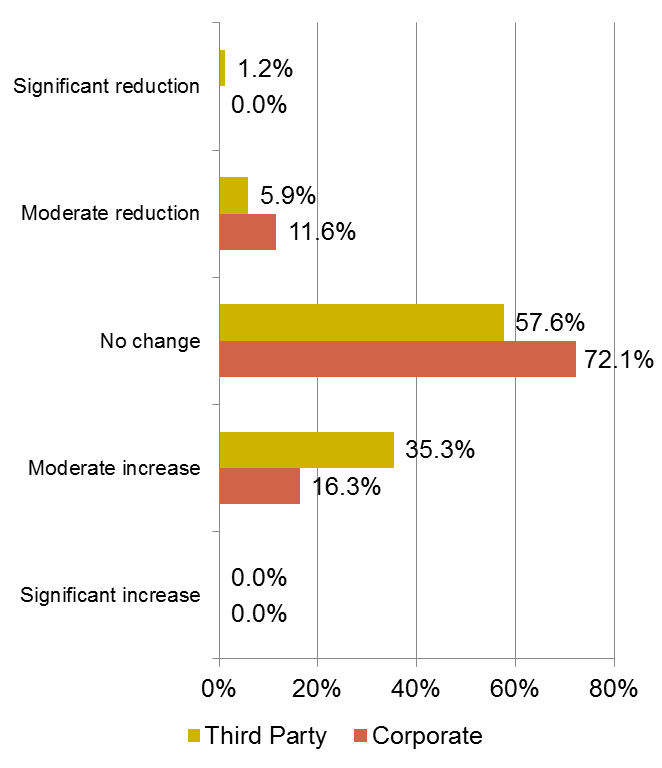 6% indicate no budget change, but reduced the component and added or increased a merchandise incentive program component. 3% indicated no budget change, but replaced the travel incentive. Slightly more than half of the respondents (52%) indicate they use Social Media tool/techniques to enhance their incentive program. 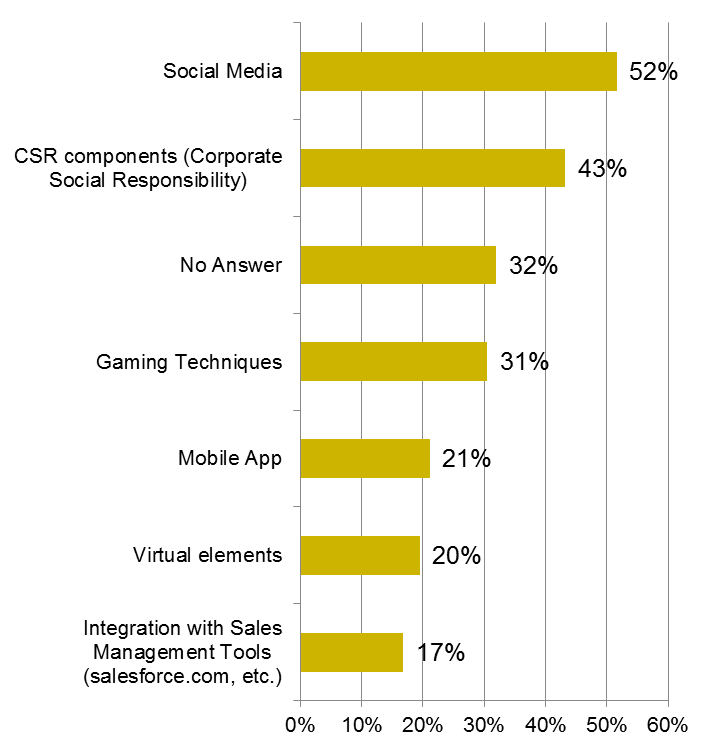 43% indicate the use of CSR components and Gaming techniques. 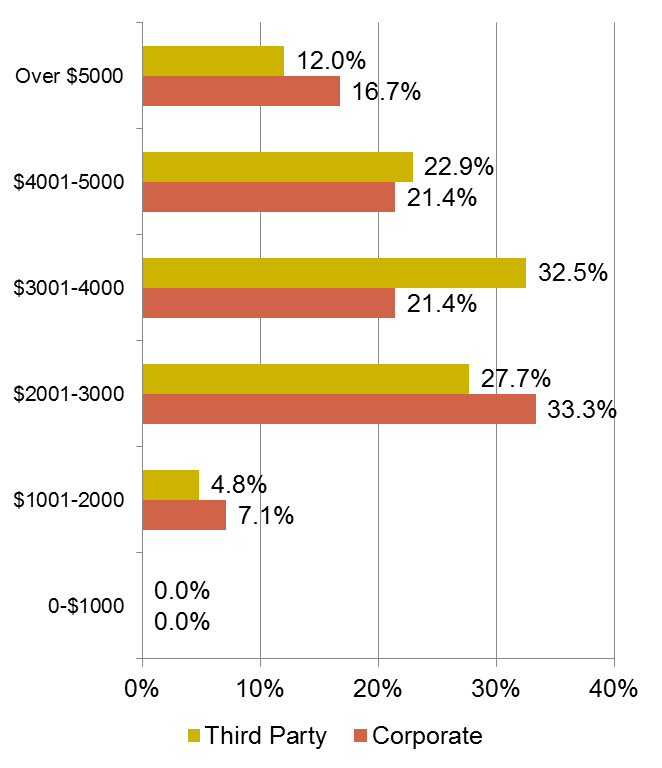 Most tools/techniques showed decreased use in the enhancement of incentive programs compared to August 2014. 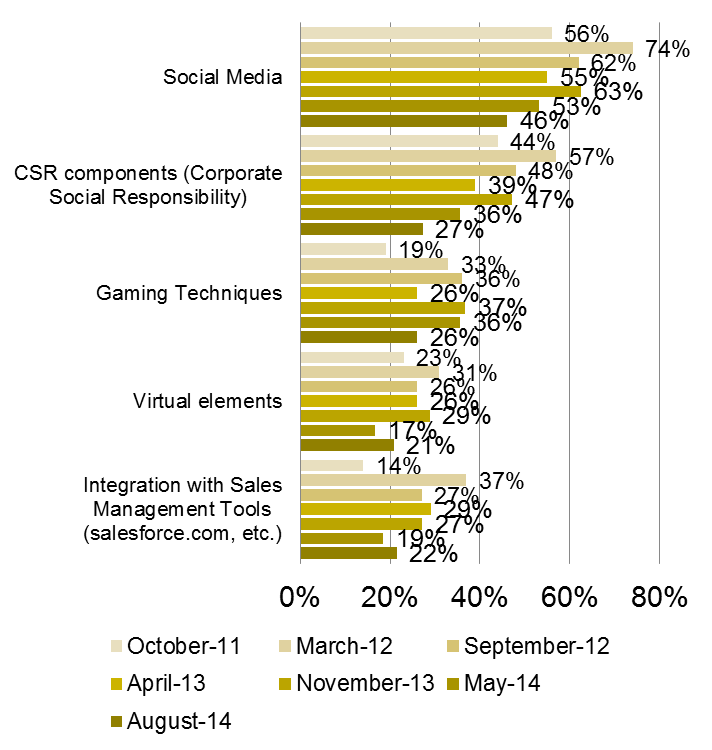 Integration with Sales Management Tools and Virtual Elements decreased as enhancement tools when compared with August 2014. The majority of respondents (74%) perceive “The Economy” to be either Slightly or Extremely positive in the coming year. While the outlook on the Economy is generally “positive”, 8% of the respondents also indicate a “negative” perception of the economy in the coming year. In general, over 35% of the respondents perceive “Slightly Positive/Extremely Positive” views with respect to each of the areas measured. 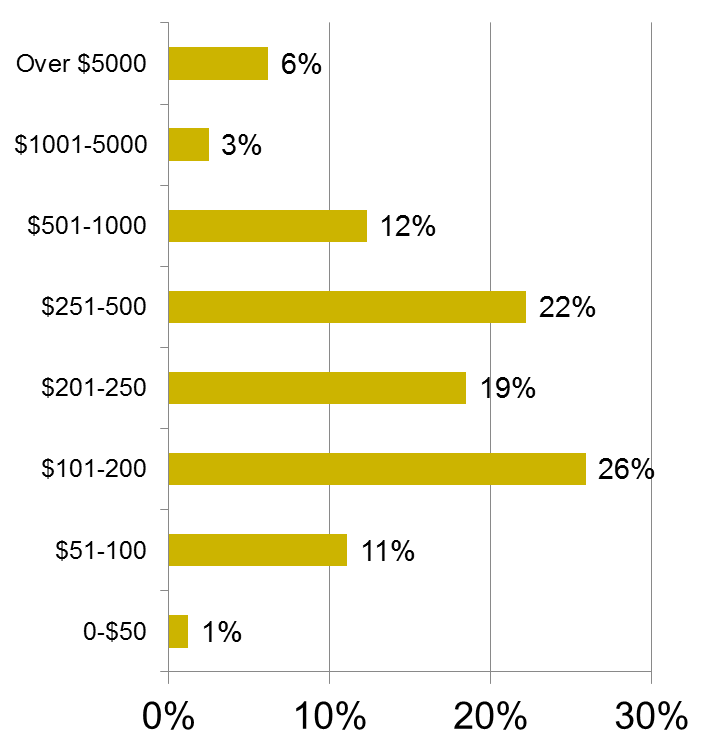 The majority (89.3%) indicated that goals/objectives are used to determine incentive payouts. 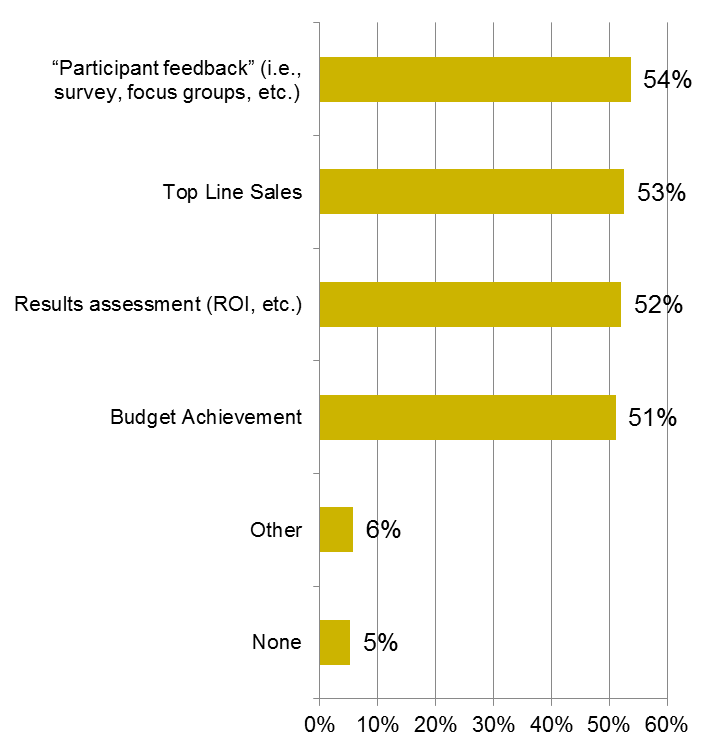 Most respondents (54%) indicate that they use ““Participant feedback” (i.e., survey, focus groups, etc. )” to determine a programs’ success. 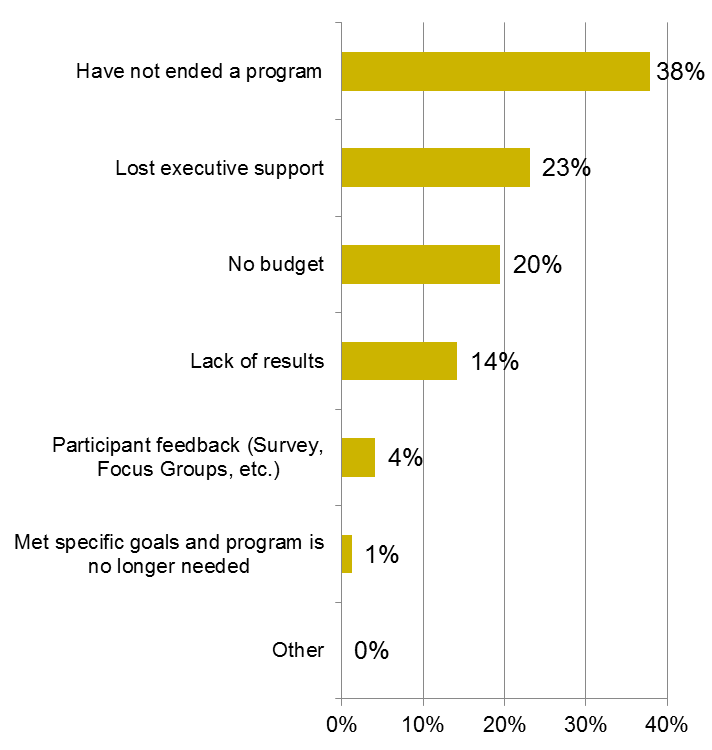 Only 5% of the respondents indicated they have no method to determine a programs success. Thirty eight percent (38%) of the respondents indicated that they have not ended a program. 23% indicated they lost executive support. 20% indicated there was no budget. 14% indicated lack of results. Thirty percent (34%) of the respondents indicated that they analyze results and program design elements Annually during a programs duration. 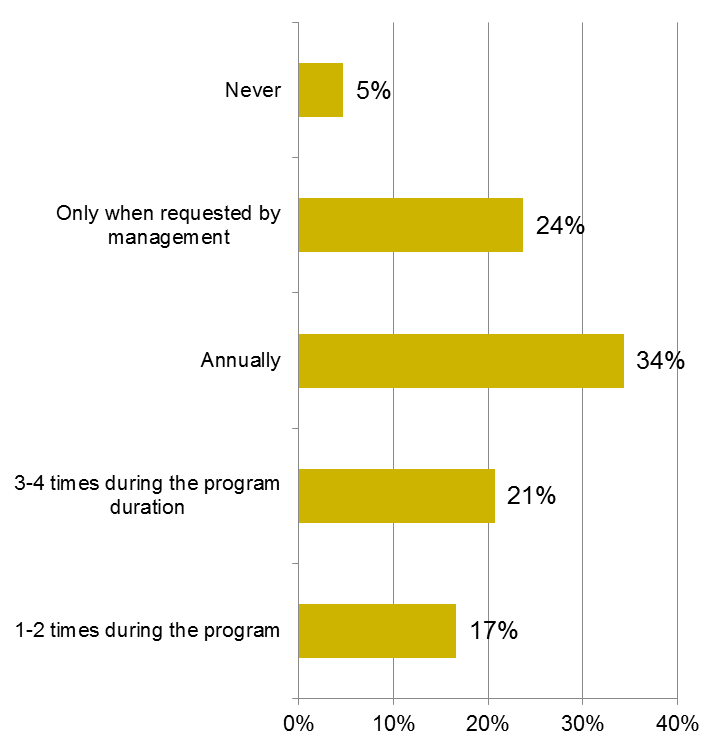 5% indicated that they “never” analyze results and program design elements during a programs duration. 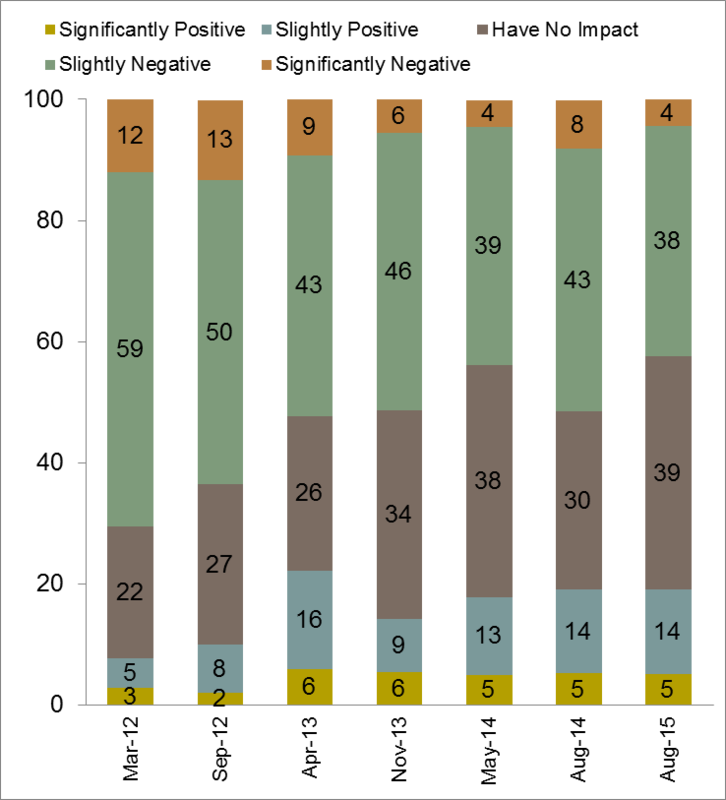 21% analyze results and program design elements “3-4 times” during a programs duration.